WASHINGTON – A divided House on Wednesday approved a bill that supporters said would boost wildfire prevention efforts, in part by excluding forests from environmental requirements. Streamlining regulations will allow more logging, which removes the forest undergrowth that can feed wildfires, thus reducing the chances of a catastrophic blaze, supporters said. But critics said the bill is “just another industry giveaway” that does nothing to address the real problem, which is chronic underfunding of the U.S. Forest Service’s firefighting budget. “Americans across the West whose homes burned to the ground this year aren’t interested in whether Congress can make timber companies a few extra bucks,” Rep. Raul Grijalva, D-Tucson, said in a prepared statement before the vote. The bill passed 232-188, with all but 10 Democrats voting against it and all but nine Republicans voting in favor, of those who voted. In Arizona, the only votes against the bill came from Grijalva and Democratic Rep. Tom O’Halleran of Sedona. An earlier version of this story gave an incorrect roll call for the final vote. The bill passed 232-188. The story here has been corrected, but clients who used earlier versions are asked to run the correction that can be found here. Approval of the measure comes as the nation undergoes the most expensive wildfire season ever, with the U.S. Forest Service reporting in September that the price tag for firefighting had already exceeded $2 billion. Rep. Paul Gosar, R-Prescott said on the House floor Wednesday that “forest management is desperately needed” to head off wildfires. In addition to the streamlined environmental process, he pointed to part of the bill that calls for arbitration of what Gosar called “frivolous litigation” filed by environmental groups. Rep. Rob Bishop, R-Utah, said claims from opponents that the bill would exclude everything from NEPA review or public input was false. The forests bill simply eliminated “redundancies” in NEPA, Bishop said. O’Halleran tried unsuccessfully to strike portions of the bill that said forest management was not a major federal action and, thus, would not be subject to NEPA review. But Bishop said O’Halleran’s amendment would have a gutted the bill. The amendment failed, 194-226. “The reason it takes so long, when it does, is because of inadequate agency funding and staff,” Brown said of the environment review process. 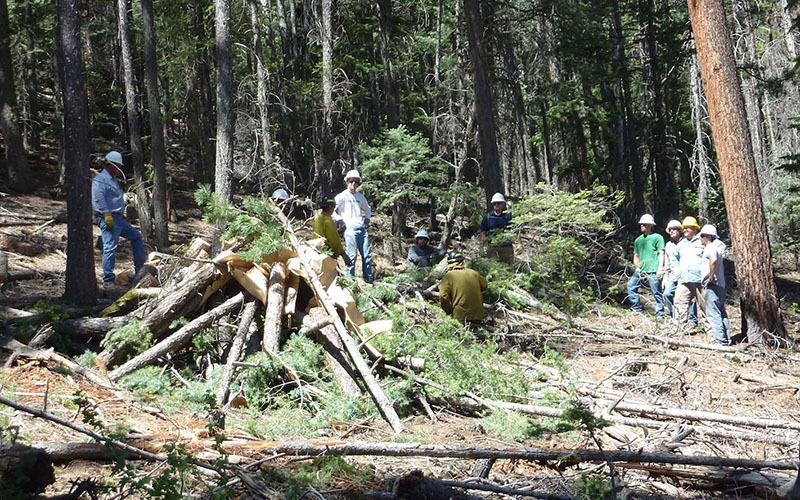 Grijalva and other House Democrats agreed that more funding for the Forest Service is the real key. Grijalva called Wednesday’s vote a “missed opportunity” to create a stand-alone funding fix to the process of “fire borrowing,” in which the Forest Service has to raid other parts of its budget to support the chronically underfunded firefighting fund. “Proper proactive management of our national forests is essential so we may preserve them,” his statement said. “We would rather spend more time managing than fire fighting,” Ribelin said. Even though they lost Wednesday, Grijalva and Brown both said that the bill was dead on arrival in the Senate.